Methadone has been widely used as a replacement therapy in the management of opioid-dependent patients (1, 2). However, it has been historically known to cause QT prolongation, leading to torsades de pointes and even death (3). Several reports of drug interactions involving methadone causing cardiac arrhythmias have been reported (4-6). An interaction between methadone and azithromycin causing QTc prolongation has not been described previously. This case report documents the potentially fatal cocktail of azithromycin and methadone. A 57-year-old male, with past medical history of chronic obstructive pulmonary disorder (COPD), hypertension and intravenous drug use, presented to the emergency department with a three-day history of fever, chills, shortness of breath and dry cough. He had been on methadone 60 mg daily for the last five years. He was subsequently diagnosed with COPD exacerbation and was treated with two courses of nebulization along with a single dose of 500 mg of azithromycin. Six hours later, he complained of chest pain, palpitations and diaphoresis. On examination, he was found to have tachycardia with other vitals remaining stable. Electrocardiogram (ECG) was done and it showed a sinus rhythm with QTc interval of 542 ms [milliseconds] (Figure). On reviewing his earlier ECGs that were done during his ongoing treatment with methadone, there was never an ECG recorded with QTc interval greater than 450 ms. Methadone and azithromycin were immediately withdrawn and he was then transferred to the telemetry floor for close observation. Within 24 hours, the patient improved clinically and his QTc reduced to 471 ms. He was subsequently monitored for another 24 hours and discharged with a prescription for ceftriaxone to be completed for seven days for his COPD exacerbation, along with other medications. A permanent annotation was put in his records on this kind of drug interaction and to maintain a high degree of caution for use of any drugs that are known to cause QTc prolongation, given his dependence on methadone. The QTc interval prolongation was most likely due to the result of a drug interaction between methadone and azithromycin as the patient presented with no other risk factors. This report underscores the risk of cardiac arrhythmias due to drug interactions in those receiving methadone substitution therapy. Methadone is often known to cause QTc prolongation and torsades de pointes. 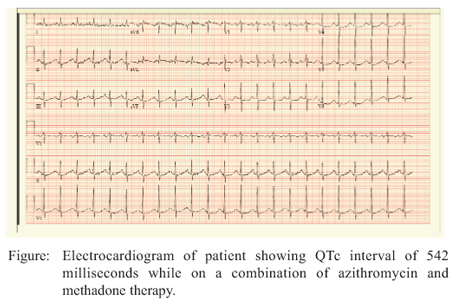 Methadone is presumed to cause cardiac arrhythmias via blockade of cardiac K+ channels, subsequently prolonging the QT interval and thereby precipitating ventricular arrhythmias (7). Usually these adverse effects are reported in those on high-dose methadone - mean daily dosage of 397 mg (8). In this case, the patient developed QTc prolongation on a rather low dose of 60 mg daily. The mechanism of azithromycin leading to QT prolongation is difficult to speculate. It could possibly be due to azithromycin being similar to erythromycin in prolonging the duration of action potential in M cells and thereby increasing the transmural dispersion of repolarization by inhibition of K+ channels (9). Moreover, azithromycin being an inhibitor of CYP3A4 could affect the metabolism of methadone. Interestingly, in less than two weeks we got two cases (unrelated patients) that were on methadone therapy for management of opioid dependence, who received azithro mycin after being diagnosed with community acquired pneumonia. Both of them complained of chest pain, palpitations and diaphoresis within hours of azithromycin administration. Electrocardiogram showed QTc prolongation in both. The two drugs were eventually discontinued in both patients and within hours the QTc interval returned to normal. Had there been a delay in identifying this fatal drug interaction, it would have progressed to torsades de pointes, a potentially fatal ventricular tachyarrhythmia. This case report assumes great significance in view of increasing use of azithromycin for lower respiratory tract infections. It is thus imperative that azithromycin be used with caution in patients who are already on drugs that are known to cause QT prolongation or that cause torsades de pointes. Nevertheless, in the opioid dependent patients on treatment with methadone who develop a prolonged QT interval or torsades de pointes, buprenorphine may be considered as a safe alternative (10). 1. Fanoe S, Hvidt C, Ege P, Jensen GB. Syncope and QT prolongation among patients treated with methadone for heroin dependence in the city of Copenhagen. Heart 2007; 93: 1051-5. 2. Justo D, Gal-Oz A, Paran Y, Goldin Y, Zeltser D. Methadone-associated torsades de pointes (polymorphic ventricular tachycardia) in opioid-dependent patients.Addiction 2006; 101:1333-8. 3. Pearson EC, Woosley RL. QT prolongation and torsades de pointes among methadone users: reports to the FDA spontaneous reporting system. Pharmacoepidemiol Drug Saf 2005; 14: 747-53. 4. Nair MK, Patel K, Starer PJ. Ciprofloxacin-induced torsades de pointes in a methadone dependent patient. Addiction 2008; 103: 2062-4. 5. NoorZurani MH, Vicknasingam B, Narayanan S. Itraconazole-induced torsade de pointes in a patient receiving methadone substitution therapy. DrugAlcohol Rev 2009; 28: 688-90. 6. Prosser JM, Mills A, Rhim ES. Torsade de pointes caused by polypharmacy and substance abuse in a patient with human immunodeficiency virus. Int J Emerg Med 2008; 1: 217-20. 7. Krantz MJ, Lowery CM, Martell BA, Gourevitch MN, Arnsten JH. Effects of methadone on QT interval dispersion. Pharmacotherapy 2005; 25: 1523-9. 8. Krantz MJ, Lewkowiez L, Hays H, Woodroffe MA, Robertson AD, Mehler PS. Torsade de pointes associated with very-high-dose methadone. Ann Intern Med 2002; 137: 5014. 9. Samarendra P, Kumari S, Evans SJ, Sacchi TJ, Navarro V. QT prolongation associated with azithromycin/amiodorane combination. Pacing Clin Electrophysiol 2001; 24: 1572-4. 10. Krantz MJ, Garcia JA, Mehler PS. Effects of buprenorphine on cardiac repolarization in a patient with methadone-related torsade de pointes. Pharmacotherapy 2005; 25: 611-14.